Whether you need relief from a stressful day, have sore muscles, or are looking for the perfect gift for a deserving someone, a therapeutic massage can make a world of difference. While cookie cutter massage chains have their place, most people want to know that their massage therapist is experienced, professional, and will treat them as an individual, taking time to hear their needs and concerns. Gift certificates for massage therapy are wonderful "green" gifts for any occasion. You can give them as a special thank-you, for wedding and baby showers, anniversaries, and employee appreciation gifts. Go to Gift Certificates for more information and to buy online. I've been a certified massage therapist since 1988 and have worked with people in many walks of life, in a variety of settings. 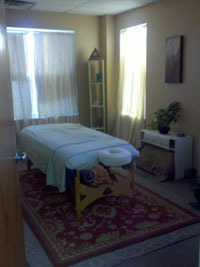 Students, seniors, athletes, moms, dads, everyone, can benefit from a massage tailored to their specfic needs. Please explore this site to find out about my services, philosophy, and other aspects of my practice. Please call 919-619-0323 if you have questions or would like to make an appointment. NPR had a wonderful piece on the importance of touch for humans. Click Here to read or hear the piece. Although the office is on the 2nd floor, we can make arrangements to use the lift for handicapped accessibilty. 103 W. Weaver Street, 2nd Flr.